An industrial suburb outside of a defended Roman town (NHER 1124), consisting of a large number of pottery kilns built alongside a Roman road. These kilns were used to mass-produce kitchen goods for local markets and further afield throughout the Roman period. Production at the site reached its peak in the 2nd century. The site also includes an Early Saxon sunken featured building. Metal detecting between 1999 and 2011 has recovered Roman, Late Saxon, medieval and post-medieval coins including a silver penny of Cnut; Roman and medieval pottery and Bronze Age, Roman, Late Saxon, medieval and post-medieval metal objects including Roman dolphin brooches, medieval buckles and a rotary key, a medieval/post-medieval leg and foot of a copper alloy vessel and post-medieval crotal bells. Roman material, including several complete kiln wasters, ploughed up indicating the site of a kiln. Excavation of kiln, and Roman metalwork finds including coins, a copper alloy terret, and Roman pottery, as well as a copper alloy figure of a deer head with antlers. 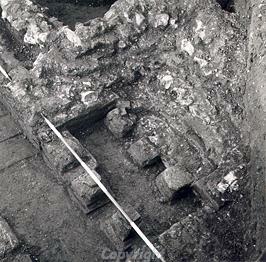 Excavation of six kilns and finds of Roman metalwork. Excavation of Roman kilns and building. Excavation of Beaker pit, Beaker, possible Iron Age, and Roman pottery, and some prehistoric flints. Pipe trench revealed Early Saxon hut. Roman pottery and metalwork also found. Traces of kiln noted in pipe trench. Fieldwork produced Iron Age, Roman and Early Saxon sherds. E. Rose (NAU) 29 January 1991. August 1999. Metal detecting. Field 28. 32 Roman, 7 medieval and 8 post medieval coins. ?Bronze Age, Roman, Late Saxon, medieval and post medieval metal finds. See finds lists, coin lists and original field find lists in file. A. Rogerson (NLA) 27 June 2000. K. Hinds (NLA) 9 March 2000. Roman coin. See list in file. S. Ashley (NLA), 6 December 2001. 5 Romano-British and 1 medieval sherd. A. Rogerson (NLA), 7 April 2008. Silver Late Saxon penny of Cnut. See list and scanned photographs in file. S. Howard (NLA), 21 May 2010. Medieval, medieval/post-medieval and post-medieval metal objects, and one post-medieval coin (not seen by I&RS). A. Rogerson (HES), 17 January 2012. --- Aerial Photograph: TG2123 A-C, W-X; TG2223 A-AFS,AGR-AGT. --- Aerial Photograph: Edwards, D.A. (NLA). 1996. TG 2123AD - AE. --- Unpublished Document: Knowles, A. K.. 1968. Roman Pottery Kilns at Brampton Norfolk. --- Unpublished Report: Knowles, A. K.. 1967. A Roman Pottery Kiln at Brampton, Norfolk. --- Newspaper Article: Eastern Daily Press. 1975. Excavations described.. 15 December. --- Serial: Green, C.. 1977. East Anglian Archaeology.. No 5. pp 31-97. --- Illustration: Unknown. Drawings of Romano British pottery sherds.. Card. 1:1. --- Illustration: Unknown. Sketch plans of Romano British pottery kilns.. Card. --- Illustration: Clough, T.. 1971. Drawings of Neolithic flint axes.. Card. 1:1. --- Illustration: Milligan, W.. 1971. Drawing of a Romano British enamelled bronze terret.. Card. 2:1. --- Archive: Clarke, R. R. and NCM Staff. 1933-1973. Norwich Castle Museum Record Card - Neolithic. Brampton (4). --- Archive: Clarke, R. R. and NCM Staff. 1933-1973. Norwich Castle Museum Record Card - Roman. Brampton . --- Article in Serial: Clarke, R. R. 1955. Norwich Museum Excavations 1954. Norfolk Research Committee Bulletin. Series 1 No 7 (for 1954) p 1. --- Article in Serial: Knowles, A. K. 1967. A Roman Pottery Kiln at Brampton, Norfolk. Norfolk Research Committee Bulletin. Series 1 No 17 pp 12-15. --- Article in Serial: Knowles, A. K. 1969. Further Work on Roman Pottery Kilns at Brampton, Norfolk. Norfolk Research Committee Bulletin. Series 1 No 18 pp 14-19. --- Unpublished Document: Gregory, T. 1980. Brampton Kiln Field.